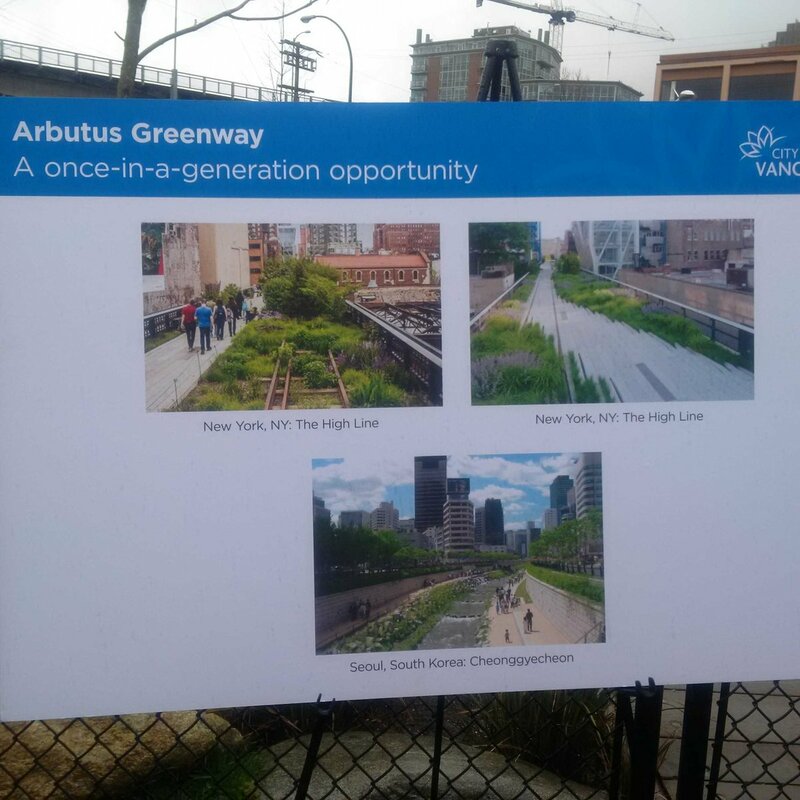 Concrete is the new “green” in Vision’s understanding of “greenway”: pave over gardens, land-scaping, safety buffer foliage — all to create bike paths for the lycra crowd Vision supporters regardless of the cost, need, safety or appearance of the result. When will Vision stop paying back Chip? Vancouver is disappearing fast. Good lord people. This is a mixed use trail – meant to be accessible for cyclists, wheelchairs and more. It isn’t meant to be a walking trail with cute little wooden bridges like the example shown above. It isn’t meant to be a recreational-only trail which is what you get when you go for gravel-type surfaces. This is a transportation corridor through the city and needs to be treated as such. A temporary asphalt path replacing rail lines is a completely reasonable approach. Nothing has been “destroyed”. There’s plenty of opportunities to landscape, to install benches, to create a lovely pathway through the city. Trust me, the blackberries that were growing over the rail lines will be back in a year without a great deal of effort to stop them. Then all boil down to what people understand as a greenway. According to the city, a greenway is a road which has horticultural components as stated by Jerry Dobrovolny …by the city standards Cambie qualifies also as a greenway, and it is possible some could be happy enough with that, and yes this boulevard is nice…but as stated by Susan Herrington, a professor and the chair of UBC’s landscape architecture program, that could be an outdated look. Am I the only commenter who shared a boundary with the corridor for 10 years? Who built one of the first gardens right next to the tracks? Who could reach out from my third floor walkway and almost be able shake hands with the CPR engineer delivering the daily load of grain to Molsons? Who has 30 years experience on the ground building stuff like this? And who happens to support the paved Arbutus multi-use trail? Judging by their comments, prof’s Condon and Herrington are academics who really don’t grasp long-term maintenance of public amenities for all ages and abilities, and the concept of universal accessibility, like this trail and others like it. My mother would have cursed the people who protested this wonderful, smooth and perfectly accessible amenity from her wheelchair. Don’t believe this? Then get in a wheelchair and try rolling a few metres after the November deluge, or even in hot dusty weather on loose gravel. Beside it I have already answered to your objections, but if you still believe what you say, why not lobbying the VPB to pave Stanley park to make it accessible? Voony, why do you label the photo as a bike path when it is a multiuse path? “multiuse path” could be the city terminology, but the path look and feels as a bike path. A french working document calls this “very bike oriented”, and from my understanding it seems french could spend energy at designing a greenway in a way that the cyclists feel “invited” into a pedestrian realm rather than the reverse. – scroll down and click on the Arbutus Corridor thumbnail for larger view and details.